The U.S. federal system of government established by the U.S. Constitution recognizes the sovereignty of both the State governments and the Federal government by giving them some mutually exclusive powers and some convenient concurrent powers. It is important to bear in mind that British Colonies in North America were independent entities under the British crown. The fight for independence earned them the right to be sovereign States. Therefore, at the Constitutional Convention in 1787, delegates represented State governments that had become autonomous centers of power. The drafters of the Constitution were very careful in order to make possible a union of States by avoiding a precise definition of the locus of sovereignty, leaving people to infer that the new charter created a divided structure in which powers were allocated between the central government and the States in such a way that each would be supreme in certain areas. Nevertheless, defenders of States' rights considered them distinct entities representing their own people and were concerned that a powerful, consolidated national government would run with abusive powers over the rights of the federated States and their people. With ratification of the Constitution in doubt, its Framers promised to add reasonable protections for the State’s rights. Accordingly, the Tenth Amendment was added to the Constitution as part of the Bill of Rights. The amendment stipulates that "powers not delegated to the United States by the Constitution, nor prohibited by it to the States, are reserved to the States respectively, or to the people." Years later, the defeat of the seceding Southern "Confederation" in the Civil War ended the dispute about State rights regarding slavery and personal freedoms, and Congress enacted the Fourteenth and Fifteenth Amendments, in part, to prevent States from denying certain basic rights to U.S. citizens. In The Federalist Papers, ratification proponent Alexander Hamilton explained the limitations this clause placed on the proposed federal government, describing that acts of the federal government were binding on the States and the people therein only if the act was in pursuance of constitutionally granted powers, and juxtaposing acts which exceeded those bounds as "void and of no force". In The Federalist Papers Nº 33 he underlines it: “But it will not follow from this doctrine that acts of the large society which are not pursuant to its constitutional powers, but which are invasions of the residuary authorities of the smaller societies, will become the supreme law of the land. These will be merely acts of usurpation, and will deserve to be treated as such." The US forefathers were very clear about a perceived danger of having a weak and unsustainable Federal Union and warned in The Federalist Paper Nº 8: “The populous States would, with little difficulty, overrun their less populous neighbors.” They did not want that but a Union with equal rights for all participating States. Therefore, Rural states do get a slight boost from the two electoral votes awarded to states due to their two Senate seats. Each state chooses electors, amounting in number to that state's combined total of senators and representatives. At this point in history, there are a total of 538 electors, corresponding to the 435 representatives and 100 senators, plus the three electors the District of Columbia is provided by the Twenty-third Amendment. True that this measure does not make a difference on any smaller individual State's influence in the sum of electoral votes, but gives them a chance to make their selection of President count as part of the cumulative weight of several small States favoring the same candidate. 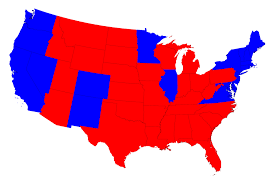 An election by a national popular vote would demolish the influence of smaller States and give political control to California, New York, Texas, Florida, Pennsylvania and Illinois. Those six States count more than 40% of the US voters, and just California and New York have by themselves nearly 20% of all US voters. While devising the US Constitution, their authors considered that: “In our case, the concurrence of thirteen distinct sovereign wills is requisite, under the Confederation, to the complete execution of every important measure that proceeds from the Union.” (Federalist Paper Nº 15). In fact, Hillary Clinton won the State of California for a majority of 3,446,281 votes and the State of New York for a majority 1,503.304. Counting all the 50 States, she got 2,865,075 votes ahead of Trump, but she lost in the sum of all 48 States with smaller population for the astounding number of 2,084,510 votes. Quite a difference. Just two large States would have decided the US election against the sovereign will of the other 48. Exactly what the US forefathers did not want ever to happen in order to avoid a US centralized government that would destroy the Federal Union. The principle quoted above is translated nowadays to empower fifty distinct sovereign wills in the election of President. The US Constitution consolidates this principle as a strong pillar of the political process by requiring a constitutional amendment, involving two-thirds approval from both houses of Congress and approval by 38 states to be abolished. An impossible task that would require the States to waive their sovereign right. Some are claiming that this system is an obsolete eighteenth century remnant, but it is a fact that the United States is not a unitary country but a Federal Union of 50 "distinct sovereign States". This is a system that has been working for over two centuries in a country where democracy has survived many crisis with only one Constitution.